I was a stuntman in Hollywood and action choreographer Peter Hein was in the US for some work. We met accidentally, three years ago, got talking about the action industry over lunch and exchanged numbers as well. Seven months ago, I got a call from him, asking me if I was interested in working for a Tamil movie. He said the part suited me well and involved a lot of action sequences. So, I sent the director A R Murugadoss a few links to my Hollywood and Vietnamese films. He too liked my work and within a few days, I was on my way to Chennai to seal the deal. I began shooting for the film last September and I was in Chennai last week as well to shoot for the film. I play the villain in the film. There are quite a few scenes that have elaborate fights between Suriya and me. I was a stuntman and turned an actor recently. I've had the opportunity to work on several big budget films as well. When I started work on 7am Arivu, I had no expectations. But I was pleasantly surprised when Murugadoss asked me to shoot a lengthy action scene on a highway in the middle of a traffic jam on the very first day of the schedule. Cars were flipping and vehicles were crashing all around. I was quite surprised when I learnt about the unit's pre-production work and the number of days they spent in choreographing the scene. The film has everything that would make it on par with Hollywood action films. 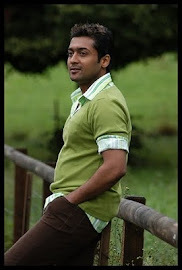 Surya is a great actor and has a lot of talent. More than that, he's a good colleague. We spent almost 42 days on just one fight sequence. He is very patient and has a greater understanding of his work. He didn't use a body double for any of the action sequences and did all the dangerous stunts himself. I now understand why he has such a huge fan following. No wonder, he's a superstar in the south! I haven't seen any of Murugadoss's films. But our thoughts matched perfectly while we were working together. He is assured on the sets and doesn't doubt his vision. This gives his actors a lot of confidence and in turn, the outcome is excellent. In this film, I play a foreigner. So, I didn't have to talk in Tamil at all. And, on the sets, everyone knew English. So, language was never an issue. However, I did learn a few Tamil words like vanakkam and nandri.